Those familiar with my How to Buy Luxury series will remember that I have a few straightforward guidelines for buying luxury effectively. (Here luxury will be defined as whatever is just beyond the top end of your budget – go on, be a little irresponsible!) Those guidelines are: buy quality, buy classic and buy everyday. Taking them in reverse order, whenever a man is considering spending a lot of money on an item he should consider how often he will use the item, how likely he is to go off it and how much it will repay the investment over time. It’s worth buying a really expensive pair of brown leather shoes if you will wear them both casually and formally, if they are a simple, classic design unlikely to be affected by the vagaries of fashion, and if looking after them will make them last years and years. For a man, this is most satisfying because it makes you feel you’ve got value for money. Not for you the seasonal fripperies of the new hot handbag. You invest; you spend your money wisely. My most recent acquisition in this category was a good leather notebook. Now, in order to fulfil the luxury tests, this had to be a notebook that could be refilled. Otherwise it was unlikely to last more than a few months. It also had to be a notebook that I would use at work and at home, to ensure I would get maximum use out of it. So it had to be a little conservative, suitable for business. Not many places do luxury stationary, and most do not offer refillable notebooks. The real top end is ludicrously expensive – Smythson, for example, has some really gorgeous writing folders in chocolate crocodile skin (sounds tasty, doesn’t it?). But they start at £280. That’s a little too irresponsible. Eventually I found the solution: the Hermes Ulysse notebook. Hermes was not one of my first ports of call. 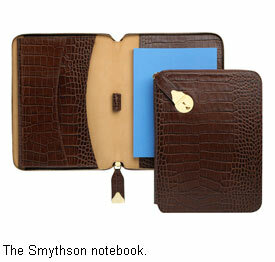 I assumed most would be in the Smythson price range, and indeed the agenda covers start at £195 and go up above £400. But Ulysse notebooks are cheaper because they are simpler – just one length of leather that the refills snap onto. Full price is £125. In the summer sale, £85. That’s still a lot for a notebook. But it is something I will use everyday at work, every weekend at home and for notes when I am travelling. Indeed, the advantage of the snap-in refills is that you can easily swap around different pads of paper for different uses. It will be blank when I’m travelling, for sketching as well as writing, and lined for notes at work. Great quality, classic (dark brown, not the green illustrated) and everyday. The pleasure it will give being taken out in meeting after meeting will quickly make it value for money. Just like the fountain pen, just like the briefcase it sits in. That’s how to buy luxury. You can follow the discussion on How to buy luxury: Notebooks by entering your email address in the box below. You will then receive an email every time a new comment is added. These will also contain a link to a page where you can stop the alerts, and remove all of your related data from the site. Moleskin can be a lovely fabric for a notebook, but leather is more formal and smarter. I believe Andrei is referring to the Moleskine brand of notebooks — they make a range of notebooks, address books, etc. They are excellent, but if Mr. Crompton wanted something that could be refilled and could take different inserts, it wouldn’t meet his requirements. Sir Fopling – of course, my error. The comment, usefully, stands, however. The Moleskine notebooks are lovely but not right for a formal environment. My concern with some of the fancier notebook covers is if you are locked into buying their (inevitably overpriced refills). Sir Fopling – you are unfortunately locked into their refills, yes, but that seems to be inevitable with all the brands I looked at. On the plus side, it is damned nice notepaper. And using both sides of a page, I have so far used half the pad in six months. So one refill a year isn’t too bad. And imagine how well it will look after the first decade of use! That is the advantage of buying a quality piece. It will last the required number of years to obtain a wonderful patina. Hello. I have just spent two days reviewing the internet and checking out notebook products on the market. I ended up purchasing the Hermes Ulysee in the colour Mykonos (blue). Excellent article. I enjoyed reading and agreeing entirely with you! I have to say that Hermes Ulysse notebook is the best notebook ever made. However, the only drawback, and its a pretty big one, is that you have to buy Hermes refills for it as nothing else will fit it. I love the notebook, but since I write quite a bit for work it was just too costly to keep the pages in it. I can’t drop $50 dollars every week or two weeks for a single refill. So I went for a hunt for the another notebook that is really really high quality like Hermes. The standards that I have were that the leather has to be butter soft and that the cover is one piece. People should check out Bespoke Goods if you’re in the market for a high quality notebook that has generic, inexpensive refills (they have refills for like composition books – $1 at any store -, and moleskines too!). 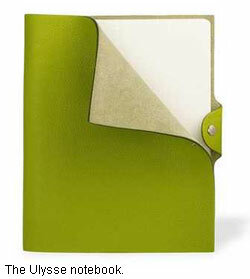 I was pleasantly surprised to see them have vegetable dyed notebooks for about 1/6 the price of a Hermes Ulysse. I notice that you don’t offer tips on buying country homes or boats or fine automobiles. You can buy an expensive crocodile eyeglass case but it’s just a way of pretending. Either you have the means or you don’t. Thanks for your comment Tim, but I disagree. It’s a question of priorities. I cycle to work and don’t own a car. I feel no need for a boat. But I take daily pleasure out of the little slices of craft in my life – and that will last me my whole life. A good notebook is a daily inspiration. It is a friend. It adds happiness to work. I understand that not everybody feels the same way. The hermes paper is the best I have ever used, better than the 20% cotton paper I used for my dissertation, better than the 100% cotton I used, better than the italian paper (by fiorentina LLC) etc.. Having a leather cover maybe for others to see, having the hermes paper is really for the paper loving self. I use the paper for writing things that are worth archiving, not for scratching. Simon, I was wondering how this had held up. Are you still as happy with the notebook as you were? Hi Simon, you can buy an A5 refill from Paperchase. As long as you retain the plastic piece at the back of the Hermes refill, this can be attached to the Paperchase refill. what size Ulysse did you purchase? The PM or MM? Thanks. Simon, I’ve read reviews the Ulysse is a bit impractical given there is no structure whatsoever as it is a single piece of leather. I intend to buy one as an agenda – to write notes and submissions as I am a lawyer. This includes writing in it on the fly, ie while on the train. Would you say the Ulysse is impractical in the sense that it needs to be used against a solid/stable backdrop? I was inspired by your vintage folio post and am now looking at the Smythson Burlington A5 ZIP Writing Folder. I adore the deerskin and also find it being sufficiently thick – other folios I looked at are on the thinner side, almost like a folder. I plan to put my wallet and keys inside along with a notebook so my pleated trousers don’t open with too much stuff in them. But the price gives me pause, at $675. Do you have any recommendations at a lower price point? Do you think it would be a good buy?